BioComfort® foam is made from BiOH polyols, a soybean derivative. The BiOH polyols reduces petroleum-based polyols in the polyurethane foam manufacturing process with the end result being a product that remains exceptionally high in quality, but is much more environmentally friendly. BioComfort® polyols can be delivered by railroad, tanker trucks, totes bins or even drums. Soy polyol is made from the oil of the soybean which is a renewable resource making it safe to the environment and for transportation. The BioComfort® recipe mix is poured onto a moving conveyor, where it is allowed to react and expand. 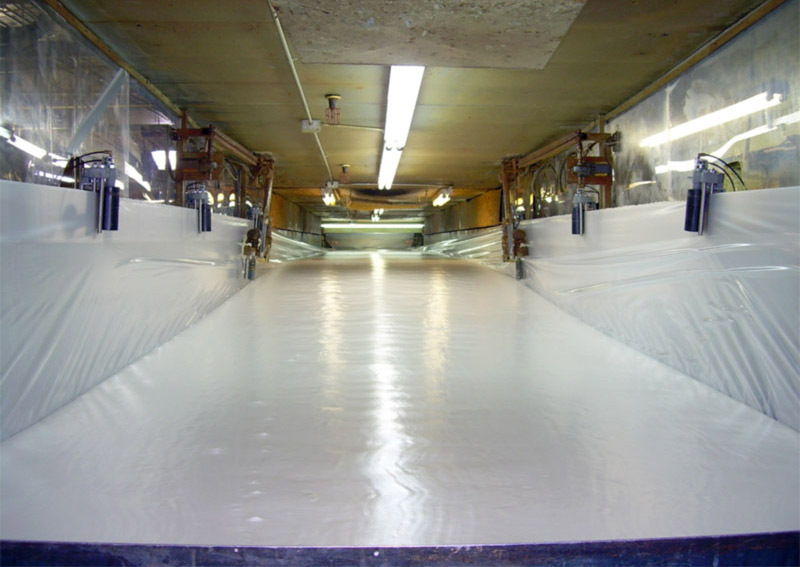 Sides on the conveyor allow the foam to rise into a "bun" or slab up to four feet high. The continuous slab is then cut, stored and allowed to cure for 24 hours. The cured foam is subsequently fabricated into useful shapes you can purchase for your furniture. Prestige uses a state-of-the-art carbon filtration system to reduce the emissions from the production of polyurethane foam. The overall system can be described as an activated carbon system working to absorb contaminants from a stream. This system uses activated carbon pellets that are 100% recyclable. All BioComfort® foam products are tested for density and consistency to make sure that the specifications are within industry standards. All test results are shared with you the customer and all departments that are fabricating BioComfort® foam. The wide range of densities and varieties of BioComfort® foams can be shipped directly to your location via our trucks. Those same trucks are also used to ship BioComfort® foam "buns" to our fabrication plant where your cushions and other foam products are manufactured.